I had been asked to create a Princess Cake for a little girl but the customer pulled out. I contacted a friend who was a teacher to ask if she knew of anyone who might like a cake. Kelly, her daughter was having a birthday - perfect opportunity! So with some redesigning a new cake was born. The birthday girl was also heavily pregnant [hence the bump] The cake was two tier with the base being a dark chocolate mud cake and the upper tier a 3 level cake of choc and strawberry - very girlie. The cake covered with ganache and topped with sugar fondant coloured with electric colours - BRIGHT. 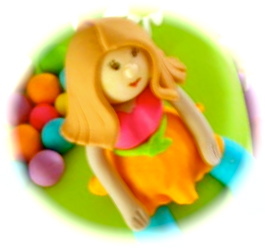 The gum paste model is hand made.